Me: So the people living/working in the Old Palace period at Knossos would have used these cups, right? Me: Thanks. Can I give you a shout out in the book acknowledgments? GS: NO, NO. DON'T USE MY REAL NAME. I DON'T EXIST. CAN'T LET MY PH.D ADVISOR KNOW ABOUT THIS. THIS IM WILL SELF DESTRUCT IN 10 SECONDS. Okay, well. I respected his/her/its wishes, but Knossos turned out to be a good book, so he/she/it had nothing to worry about. Onto the pottery. 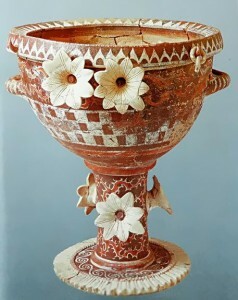 The Middle Minoan period saw the introduction of the potter's wheel, the construction of the first palaces, and the spread of Minoan pottery to other parts of the Aegean. 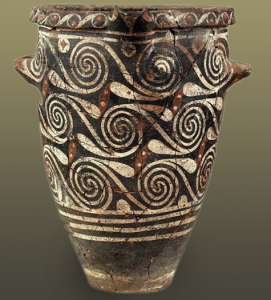 This is when Minoan pottery really gets Minoan. This is the Prepalatial Period at places like Knossos. Peak sanctuaries like Mount Juktas were at their height during this period, and the first written inscriptions, on seals, date from this time. 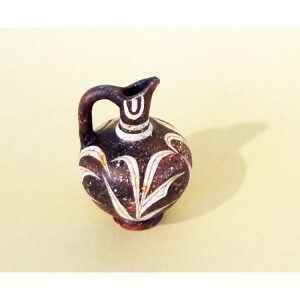 Pithoi begin to appear, and, as far as archaeology tells us, Minoan pottery starts to be exported to the Peloponnese. 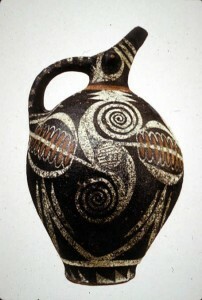 In MM II, Minoan pottery becomes more widespread in the Aegean; it is found in the Cyclades, as well as Egypt and the Levant. 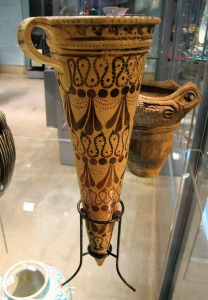 Keep in mind that earlier pottery styles like Kamares continued to be used; the Minoans didn't suddenly stop using older wares on January 1, 1800 B.C. In fact, Kamares evolved into styles like Patterned and Floral Ware, which was less abstract and took inspiration directly from nature. This is the Neopalatial Period, when all over Crete sites like Knossos and Phaistos were rebuilt following an island-wide destruction (probably an earthquake) severely damaged the Protopalatial sites. Patterned Ware (MM III A and B) is an evolution from Kamares, in which we begin to see more realistic natural forms like lilies, palms, and papyrus. 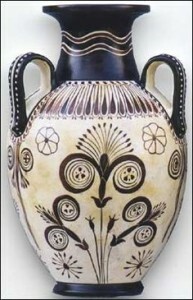 This type of pottery further evolved into the Floral Style, whose motifs also appear in frescoes from the period; the Neopalatial saw the first Minoan-type frescoes. There isn't much to distinguish these two pottery types, so I've lumped them together. Next time: the Late Minoan and Minoan-Mycenaean periods, the Marine Style, and the Age of Effloresence.